Laura Guralnick remembers the day she learned that the big, vacant lot at the end of her Brookline street would, in a few years, be developed into an affordable housing complex for senior citizens. Unoccupied for the last 15 years, the site is an 8.2-acre plot of land with old buildings on it — abandoned since the DePaul Institute for the deaf moved to Shadyside in 2002. As someone who’s worked in affordable housing development and advocated for it, Guralnick was overjoyed. “Once I found out what that was, I was like, ‘Yes!’ because everyone wonders what’s going to pop up in your neighborhood,” she said. She even called her mom, she was so happy. And later, because she knew Ernie Sota, a local “affordable housing-famous” developer on the project, she called to congratulate him. 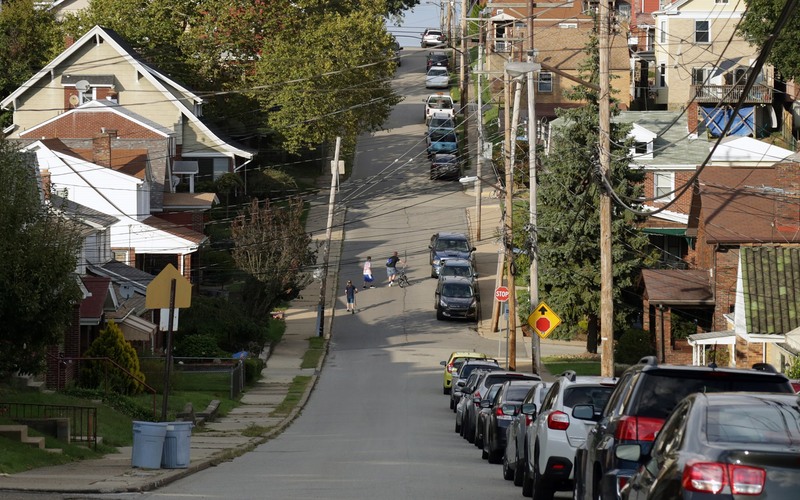 But that was two years ago, and for Guralnick and many of her neighbors on Castlegate Avenue in Pittsburgh’s Brookline neighborhood, that’s where the excitement ended. As the project plowed forward, they would learn that almost nothing could put a pause on the work to evaluate developers’ practices and the project’s effect. Dust from the demolition site “billowed” past the property line, residents living nearby said. They described waking up with sore throats, coughing frequently and having trouble breathing. Guralnick and Angela Gaito-Lagnese, who lives caddy corner from her, said they began finding chunks of insulation and other debris in their yards. Their kitchen tables and television stands developed films of dust and black-gray particles. At the center of the problem is a governmental conundrum: The development project is located in Mt. Lebanon, and was approved by its commissioners, while it is Pittsburgh city residents who are feeling most of the negative effects. Because the project falls just outside of the district represented by City Councilwoman Natalia Rudiak, there’s little she can do, officially. Mt. Lebanon commissioners say the project so far hasn’t violated their codes. The Allegheny County Health Department has stepped in to alleviate some of the problems but its powers, too, are limited. While it does have the power to halt a construction project, it rarely does, and will typically only step in if there are concerns that asbestos is in the air. Meanwhile, the developers say they’re doing all they can to follow the law. The construction site is at the intersection of Castlegate and Dorchester avenues. Shortly after the DePaul Institute moved, Residential Resources, led by President and CEO Jeff Lengel, purchased the property and the empty school buildings. Lengel couldn’t find a use for it until about two years ago when his company began exploring a deal to sell 2.7 acres of it to the Allegheny County Housing Authority. The authority is interested in building a four-story, 60-unit building for affordable senior housing. Lengel said he would like to see townhouses on the other half, though the old school buildings there still stand. The housing authority, which is receiving a low-income housing tax credit and partnering with Oxford Development to complete the project, is in the final stages of buying the land and hopes to complete the project by early 2019. 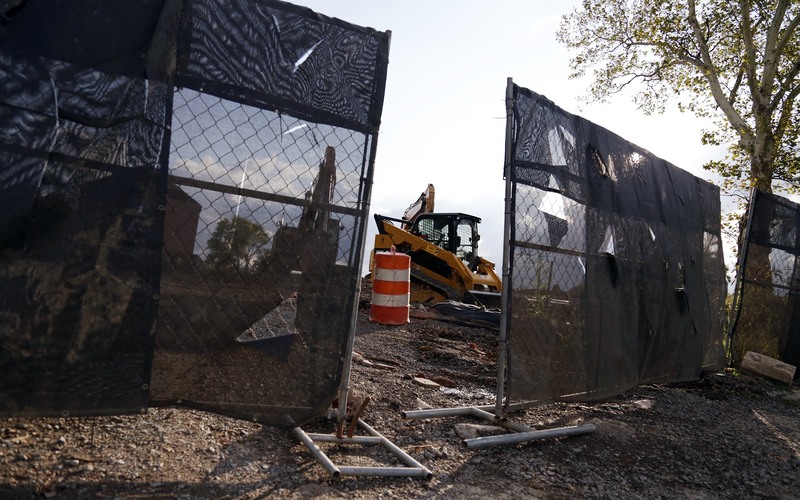 In the meantime, Lengel contracted with Continental Construction and Demolition to raze the part of the land it would be selling. That’s where the problems began. 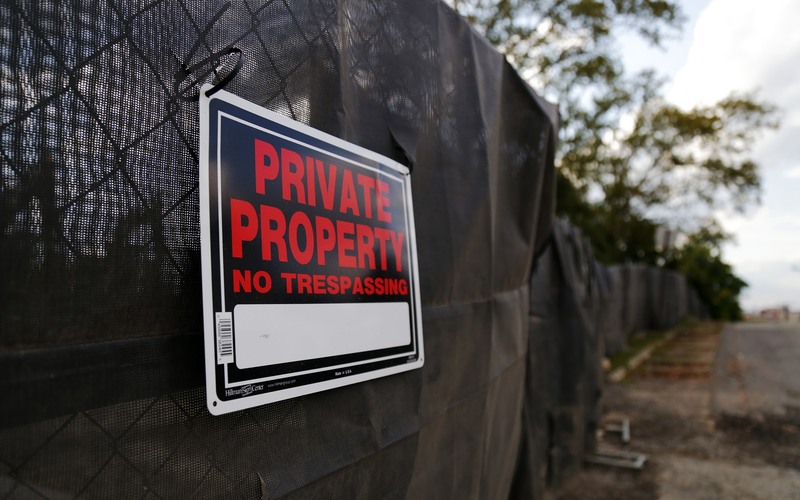 While Ernie Sota, the owner of Sota Construction, vouched for Continental’s work, residents said that company’s president, R. Blaze Lambing, caused many of the problems they’ve had with the site. On top of not keeping dust and debris contained on the demolition site, the residents say Lambing has been confrontational. In April, the health department issued an air quality violation to Lambing, and he was charged a $2,000 fine in August. Though he agreed to do an interview with PublicSource in mid-August, Lambing has not returned subsequent calls and messages left on his cell phone. Both Lengel and Sota said they have been taking steps to make sure the site was being run appropriately. “To the best of our knowledge, Continental has been trying to comply,” Lengel said. Guralnick, the Brookline resident, admits she doesn’t know everything about affordable housing construction — she mainly works on the office side of the process — but she knew something was amiss when demolition started. For example, she knows that when you’re knocking down large buildings, it is typical to use water cannons to control dust and debris. To add to her worries, Guralnick was pregnant during the demolition and had her baby in the spring when the problems were the worst. When she told one of her doctors about the dust, the advice she got was to find “alternative housing” while the project was underway. She keeps her daughter indoors most of the day, only taking her outside in the evenings or after demolition has stopped during the day. “I’m sort of at my wits’ end. I’m very concerned for my baby’s young lungs,” she said. For Gaito-Lagnese across the street, the demolition took out part of a hillside near her home, causing stormwater to rush into her yard when it rained. She also had occasional run-ins with Lambing as she and her husband picked up debris outside their home. Then, one evening in April, while cleaning up debris from the yard, Gaito-Lagnese’s husband started shouting that Continental was “poisoning our neighborhood” and that he and his family couldn’t breathe. The couple says Lambing confronted him. The two had a shouting match. Then, the police showed up and questioned Gaito-Lagnese and her husband about the incident. Both Sota and Lengel continue to vouch for Lambing’s track record as a contractor and said they hadn’t heard complaints about his run-ins with residents. Sota said he had sent someone to the site to monitor it for dust and debris. Lengel also said he’s been in touch with Lambing and has taken steps to ensure the demolition was handled appropriately. Perhaps most frustrating to the Brookline neighbors has been the lack of action. Since at least January, Guralnick and Gaito-Lagnese, the most outspoken residents, have been in touch with Rudiak’s office. While Pittsburgh has no official control over the Castlegate project, Rudiak and her staff had city engineers conduct a traffic study (published in April) and organized community meetings with developers in January to alleviate her residents’ concerns, though those occurred before the demolition became the chief concern. Then, on Feb. 16, Rudiak’s office organized a walk-through of the site with city engineers and other officials to assess some of the stormwater and traffic concerns. Despite her attempts, Rudiak would prove to have little power to stop the dust problems. Her office tried to organize a second meeting between developers and residents in July, but it didn’t pan out. “Essentially, if the project was in the city, it’s possible the residents would have been given more credence,” said Bethani Cameron, one of Rudiak’s assistants. Gaito-Lagnese and Guralnick began calling the county health department early this year to complain about the dust. Health department records show inspectors were on the site March 9, 10, 21, 23 and 24, and eventually issued a notice of violation to Sota and Lambing on April 4. In its letter, the health department noted that Lambing was not using enough water to control the dust; the inspector said he saw someone using a garden hose and nothing else. While Mt. Lebanon commissioners allowed some Brookline residents to speak at their meetings about their concerns, commissioners Kelly Fraasch and David Brumfield said there was little they could do. Fraasch said Mt. Lebanon municipal managers and inspectors were on the site several times, but their assessments never led to violations under Mt. Lebanon’s building codes. The biggest concerns fell squarely into the health department’s jurisdiction. According to Rachel Filippini, the executive director of the Group Against Smog and Pollution [GASP], the health department appears to be the only agency that could intervene, though it could do more. The health department’s Jayme Graham says they’re doing all they can, what with sending inspectors up as often as once a week and issuing an air quality violation. But health department inspectors only look for visible dust leaving the site. They don’t use any equipment to see if smaller particles leave the site. The health department’s Jim Kelly, the deputy director of environmental health, said the agency is limited in what it can do because of what is outlined in its air quality ordinances. Those guidelines, for example, don’t require the use of dust suppressants, like water cannons and tarps, for construction and demolition projects, in part because neither the Environmental Protection Agency nor the state Department of Environmental Protection explicitly mandate it. And, Kelly said, such guidelines would be difficult to write and laborious to enact because construction and demolition varies project to project. “This is one of those areas where we could use some better definition on what we’re supposed to do,” Kelly said. Demolition is mostly over. But the new phase is still kicking up dust and problems for the residents. Day after day, they say, dump trucks enter the site full of what is called “clean fill” — stones, bricks and concrete that will be ground up on site to level it and build the foundation. For the Brookline residents, September marks nearly a year they’ve been concerned about the project. Guralnick and Gaito-Lagnese are clear about one thing: They like the idea of an affordable housing development and do, in fact, want it in their neighborhood. What they don’t want is the dust, the sore throats and the health worries. 25 years ago when my first wife and I attended activities at DePaul Institute, I had a nice argument with an Assistant Chief from Mt Lebanon Fire about their refusal to consider putting Pittsburgh’s 26 Engine – about 5 blocks away and closer than anyone else – on their run card for the school. It’s pretty sad that local government still can’t figure out how to work together to avoid situations like this. Instead of shrugging it off and passing the buck, Lebo needs to figure out how to proactively coexist with its neighbors in the city.